The flag of the Federated States of Micronesia (FSM) was adopted on 30 November 1978. 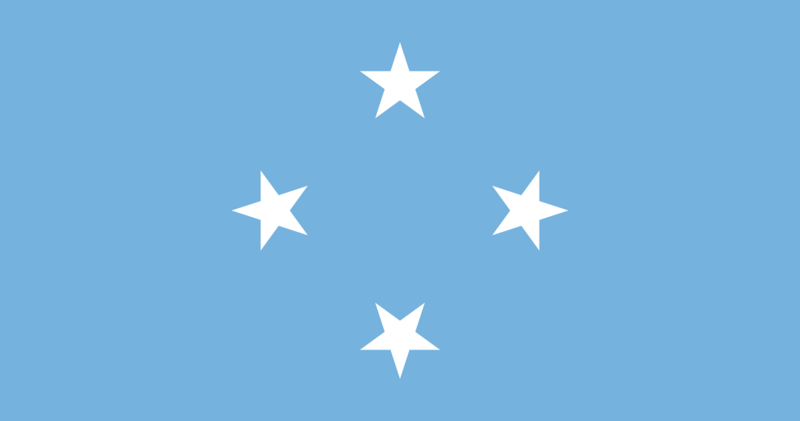 The blue field represents the Pacific Ocean, while the four stars represent the states in the federation Chuuk, Pohnpei, Kosrae and Yap, similar design with six stars was in use from 1965 for the flag of the Trust Territory of the Pacific Islands. Kosrae was then part of Pohnpei so both were represented by one star. The three extra stars representing Palau, the Marshall Islands and Northern Mariana, which chose not to participate in the Federation. The flag, adopted in 1978, is in the colours of the UN flag. The light blue also represents the Pacific Ocean. In an echo of U.S. heraldic practice, the stars represent the entities that make up the state, in this case, the four federated states, arranged like the points of the compass, although the states locations are actually distributed from west to east.